An open letter to Jamey French of Meadowsend Timberlands: In early April, you and other members of the owner/directorship of Meadowsend Timberlands met with leaders and residents of the town of Windham because you insisted that you had something to say that would be of benefit to our community. We wondered what it might be: Our town plan, adopted in 2008 and strongly supported by the community, was crystal clear in its opposition to utility-scale wind installations in our town. And yet sometime in the past couple of years (the exact timing remains a mystery to us) without mentioning it to anyone in our town, you and your fellow directors approached a multinational wind developer, Iberdrola, to explore the potential of industrial wind for a Windham property that you own, — 3,000 acres of the Stiles Brook Tract, lying in the heart of our town. In the course of our April meeting, it became apparent that you were unaware of why Windham’s town plan, its leadership, and a majority of its residents and property owners oppose industrial wind installations in our town. You also appeared to be unaware of how your actions are construed by many of the people of the town. Why Windham’s town plan, leadership, and most residents and property owners oppose industrial wind in our town: Windham’s town plan represents the culmination of intensive study of both wind power in general and siting in our town in particular. 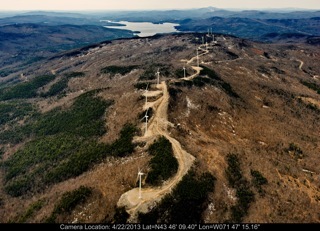 There are clear indications that Windham is likely the most inappropriate site for utility-scale wind in the entire state. Some of the pertinent facts in this regard: A majority of Windham homes are within a mile of the proposed site; the Stiles Brook Tract (SBT) is part of one of the largest remaining privately owned contiguous forest blocks in southern Vermont; SBT is home to the headwaters of Saxtons River and is riddled with wetlands and steams; SBT is in the shadow of Glebe Mountain, resulting in a particularly gusty and variable wind resource. In addition, the terrain includes many slopes that exceed 25 percent grade; the denuding and covering of these slopes with impermeable surfaces would contribute to stormwater runoff that could not be contained in banks or by culverts, creating subsequent erosion and downstream flooding at great cost to our town and its people, as well as to other communities that lie downstream. Many of us are familiar with this information; we developed our expertise in the matter of wind energy during a previous approach by a wind developer. How your activities are construed by many of Windham’s residents and property owners: That you and the developer have operated in secrecy has created a sense of distrust and outrage among many of us. We are angry that you invited a developer to put up meteorological towers to assess a tract of land in the heart of our community for an industrial installation that we have expressly prohibited, without making any effort to discuss the matter with us beforehand. How likely is it that our town would experience a blueberry farm as being the same as an industrial wind installation? We’re not children, nor are we stupid. To suggest parity between these two uses of property in our town is just plain disrespectful, and underscores how easy it is to minimize, even ridicule, the concerns of a community you don’t live in or near. Since the day we learned of your intentions, the people of our town have been subjected to an absolute information blackout. Our efforts to learn about the developer’s ideas regarding the site have met with stonewalling of a particularly condescending nature. We, like any targeted community, can determine the most likely sites for roads and turbines and estimate the effects on surrounding homes, properties, and roads, using readily available mapping information and technology. The fact that you and the developer insist that this information doesn’t exist suggests that you are unwilling to take our concerns seriously. On the other hand, if it is your intention to heed the concerns of the community and to ensure protection for the health of Windham’s environment and property owners, why haven’t you told us so? Why not discuss with us, from the beginning, exclusion zones, where wind turbines would not be placed, in the event that the developer decides to proceed? It is disquieting that the nature of your relationship with Iberdrola remains a mystery to us. Although you insist that you are in command of this project, Iberdrola has served as your mouthpiece, and our effort at dialogue with Iberdrola has not been a fruitful one. Their attitude is cavalier, to put it mildly. For example, Jenny Briot, Iberdrola’s most consistent presence among us, stated in the press last June (months before meteorological towers were permitted or installed on the SBT) that Iberdrola would know whether the SBT project could go forward by spring of 2013. Imagine what that statement meant to us, given our understanding that wind measurements must be conducted for at least two years to provide meaningful data. It clearly meant that SBT was a done deal as far as Iberdrola was concerned, and that data were not to be part of the decision-making process. Your secrecy and stonewalling about a project of this magnitude in the heart of our community have created an atmosphere in which it is difficult for townspeople to make plans, sell property or imagine our futures. Because of this, many of us do not consider you to be the excellent neighbor you commend yourself for being. Instead, your behavior strikes many of us as ignorant, cruel and unjust. It seems likely that the Windham community, which supports renewable energy and has a history of reasonable behavior, would have responded very differently to a respectful approach, one that made our concerns part of the discussion from the beginning. Nancy Tips is a resident of Windham. Tags: Stiles Brook Wind. Bookmark the permalink.